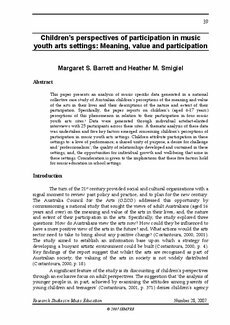 This paper presents an analysis of music specific data generated in a national collective case study of Australian children's perceptions of the meaning and value of the arts in their lives and their descriptions of the nature and extent of their participation. Specifically, the paper reports on children's (aged 6-17 years) perceptions of this phenomenon in relation to their participation in four music youth arts sites. i Data were generated through individual artefact-elicited interviews with 25 participants across these sites. A thematic analysis of these data was undertaken and five key factors emerged concerning children's perceptions of participation in music youth arts settings. Children attribute participation in these settings to: a love of performance; a shared unity of purpose; a desire for challenge and `professionalism'; the quality of relationships developed and sustained in these settings; and, the opportunities for individual growth and well-being that arise in these settings. Consideration is given to the implications that these five factors hold for music education in school settings.